River Gallery-The Art of Living was created in 2005 when Barry and Tony decided it was time to make some changes from their life in Manhattan. Having lived in Narrowsburg since 2001 as second home owners, it was time to redirect some energy into new endeavors. Both Barry and Tony come from over 20yrs experience each in the fashion industry, having worked with such distinguished designers as Versace, Ungaro, Yves St. Laurent, Leonard-Paris, and consulted with Valentino and Etro. Both were involved extensively with wholesale/retail operations for fashion and home, fashion shows, sales, special events, working closely with the designers and many celebrity clients. Both have traveled extensively throughout the US, Europe, and Asia. Channeling this world of experience to create their own retail environment in this country setting on the Delaware River has allowed them to build a business with an artful approach blending the elements of art, design, and nature. They felt it was essential to design a space that would stimulate one's senses. The feeling up here in the Catskills is very organic-all about wood, stone, water, metal and creativity, blending the styles of East and West. They have created an eclectic environment of diverse and quality product: working with local artists, Asian and American antiques, and gifts for the home. The selections are unique and displayed in varied vignettes to stimulate the customer to envision the items in a proper setting with a high degree of control over product placement. As they often say, the store is "antique style for modern living". A variety of product are offered at a variety of prices, something for everyone: great art and antique selections, gifts for the home, hand-crafted jewelry, reclaimed wood and horn products, soaps and body products from Provence, cooking essentials from Florence, lovely choice of scented candles, local jams, salsas, organic honey, and lounge-styled CD's. Custom framing and painting restorations are also available. 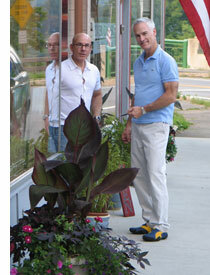 Barry and Tony hope that visitors will come visit and enjoy the relaxing atmosphere of their store. A day in the country does so much for the spirit.